And then the count down and we are off and I am there. I am so there. You should have seen it. You really should have seen it. Right now, I’m drinking Typhoo tea, eating rice pudding, watching a TED talk about vulnerability in relationships and all I can think about is my relationship with cyclocross. The presenter, Brené Brown, is talking about courage. She is saying that it is different from bravery in that it is about telling the whole story of who you are with your heart. It is about telling your imperfections; these imperfections are part of who you are. Now, two days later and I’m riding on grass. I’m “one, two, three” jumping onto my bike. Do it. Jump. Lift off. But, I can’t. I’m stunted motion. Before cyclocross practice, I’m talking with a friend and we are listing our goals of the season. Mine: to mount my bike in the proper cross fashion. It is a kind of delicate hop. When done properly, it is beauty on a bike. It is smooth, fluid motion. It is that delicious crème of espresso. It shows you know what the hell you’re doing out there on the course. 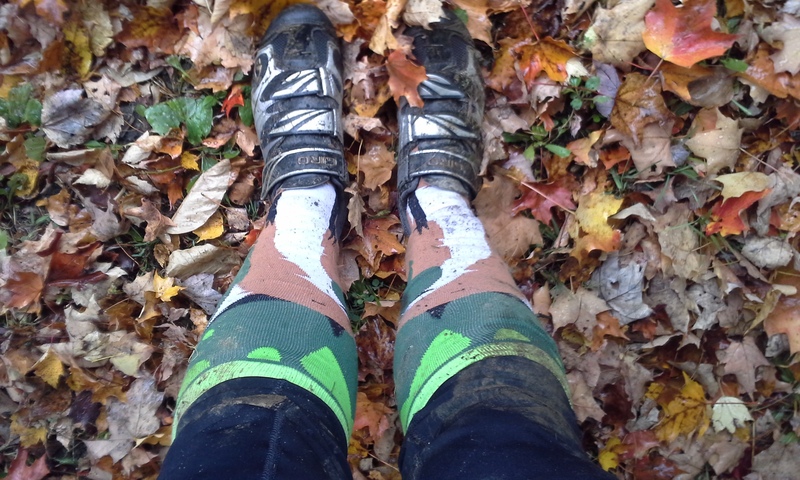 For me, cyclocross is transitions. It is literally being on the bike and then hopping off of it. It is transition from summer to fall. It is road to indoor training. I know others who cyclocross is the whole burrito. It’s the reason they bike, but for me, it’s more like a little dessert at the end of a hard, trying, but ultimately satisfying road season. Cross is also about vulnerability. It is five o’clock on a Thursday coming to a tree filled field by a lake. It is about going there without much ego. It is putting myself out there. It is getting on the bike and just trying. It also falling, getting hurt; it is often, mud and blood. At this Thursday’s practice, there is this moment when I am in the peanut (a small course set up to practice turns) and I am pure reaction. I am finding the apex, finding the right line. I am trying to go fast and turning and not being scared. I have transcended the fear of last year’s season. 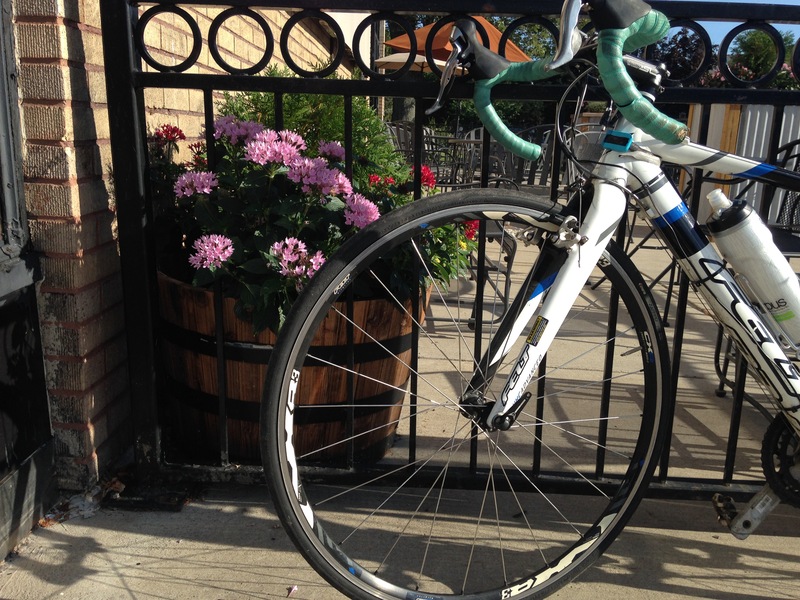 After this much riding in the summer, I am more comfortable on my bike and with these new wheels and tires, I have so much control and my fitness level has improved. I can turn and be alright. I realize I am just one big smile across my face because I feel like I’m doing a pretty good job. Then, the group of us, maybe fifty people, line up in a mass start. It’s the mock race around the park. I am one of these fifty: one tiny star in a galaxy. I don’t mind. I come here to learn. I don’t come here to win. Not yet anyway. We are off and it is tight at first. We are nearly knocking into one another’s wheels. I am trying to pass my teammate. It’s funny to ride like this. Usually I’m trying to be on her wheel, not overtake her. I want to beat her though. I really want to beat her. That’s what I like about this teammate, we can compete with or against each other and at the end of the day, we’re still going to have that beer together. I’m behind her and I pass her and I see my other friend speed up on the inside and I’m trying to create some room. I feel good on the rollers. I’m moving along. Then, I get to the stairs and I know she’s going to beat me here. I’m fine with the dismount and the run up the six steps, but then getting back on, I’m molasses and she beats me here. Then I’m on and hop over the brick, and I think I can beat her on the descent. I nearly crash on her back wheel, but I don’t and I’m okay and then I pass her on the turn and we joke because on the straight away she flies by me. Then we get to the barriers and this thing happens. I get scared. I’m coming in fast and I’ve unclipped one leg but then I feel my center break and I’m falling onto my bike. I’m descending down, smashing into. I’m gears into leg, chain ripping through skin. I get up and hear my breathing as I pick up my bike. It’s asthmatic. It’s choppy. I wonder if I’m okay. 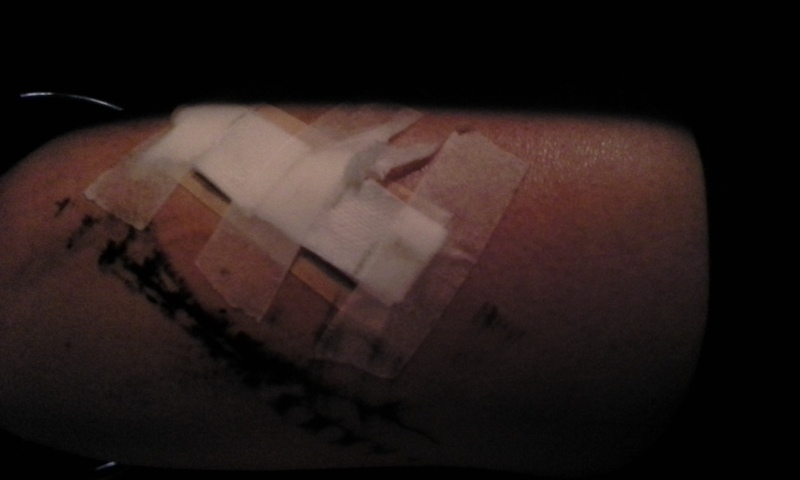 I look down and I see blood and grease and the outline off a chain in my thigh. 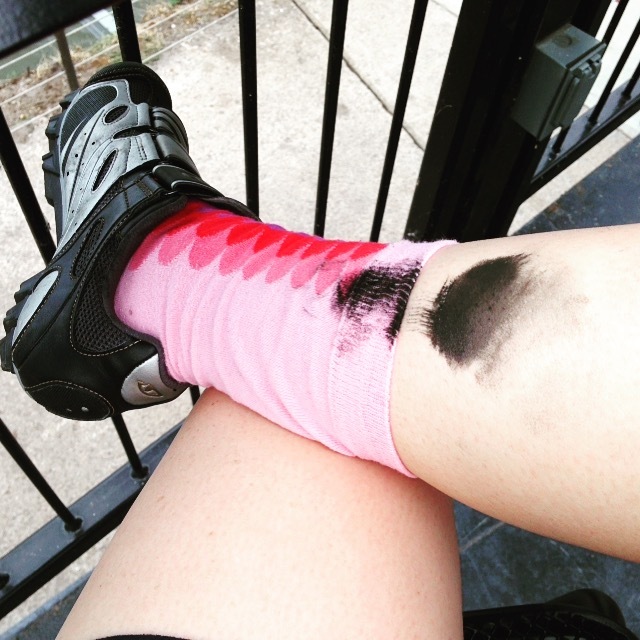 I am not okay and then it’s blood and tears on my gloves and the consoling words of my fellow cyclists. And now, it’s the next morning and I’m at work wearing a skirt with this massive bruise and a two inch line of scabbing blood showing. I still have grease stains on my legs. I couldn’t wipe them off this morning, so I go into the college looking like a hooligan. I wonder if people think street fighting is my outside of academics hobby. It’s not a bad look, but not the most professional. Cyclocross is hard. It’s brutal at times, at least for me. However, to crash sometimes is to show your vulnerability. I am human and I fall. To be courageous is to dare to try to be the person you admire, your best self. 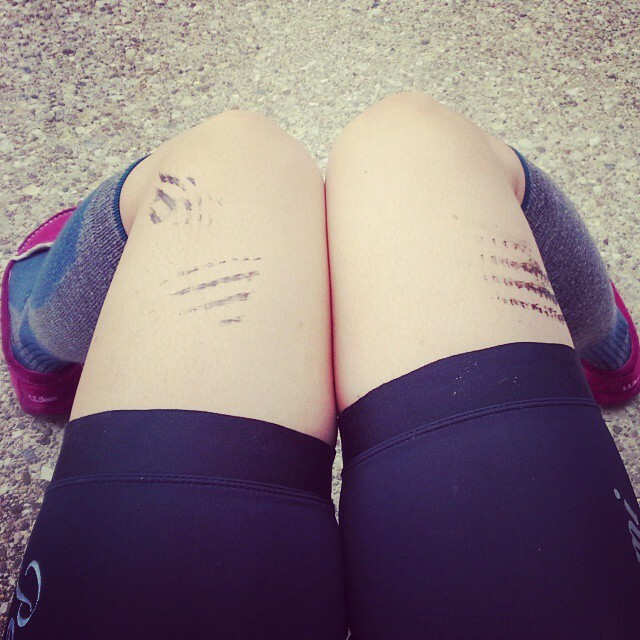 Cyclocross is scary and rough, but I am learning. This fall I want to ride cross and to live my life, quite proudly, with the notion that I must try and not give up. This is and has always been the story of my heart.